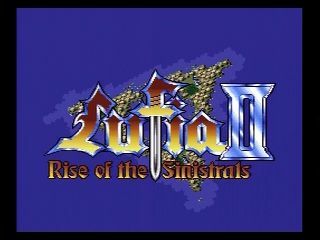 I just finished an RPG that I have been trying to get through for years – Lufia II: Rise of the Sinistrals! Back in high school I played this game on an emulator and loved it although never quite got through it. After getting back into retro games, it was one of my first “rare” purchases. It was an awesome retro RPG experience. The player begins the story as Maxim, a monster hunter from a small village. Monsters are becoming more prevalent in the region, and so you go an investigate. You eventually find out that you must go on a journey to vanquish the Sinistrals, Along the way, you meet some interesting characters willing to help you on your quest! Overall the story is pretty damn cliche, but I was surprised how mature it was in certain spots – villages get destroyed, people die, and the good guys don’t always win. The Sinistrals themselves are quite one-dimensional although there are a few nice twists in the later part of the story. The ending itself was a bit of a tear jerker – which was something I was not expecting. The story is a simple but mature story with some moving moments. Having said that, the game really shines in the gameplay. There are no random encounters in this game. As you walk around the world, you see where the monsters are, and if you run into them you start a battle with them. The battle system is simple enough – you generally have two melee fighters in the front and two magic users in the back. What makes battles more interesting is that you can call upon “IP” power attacks, and the attacks you can choose from are based on the equipment that you have selected. The most powerful armour is not always the best armour to use because it might not have the IP attack you are looking for. In addition, as you travel the world you can find seven “capsule” monsters who help you in battle – and the more you feed them items, the more powerful they become! In terms of music, this game has some seriously awesome tunes. The battle theme is great – but the boss theme just gets you pumped! I also enjoyed the over world map music – it really set the mood for exploration. I would highly recommend listening to some of the songs on youtube if you are on the fence about this game. The graphics themselves look fine – they are cutesy and do the job but northing to write home about. 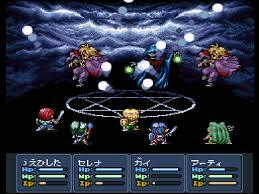 All in all – this is one of my favourite RPG’s for the SNES. It has a simple but mature story, awesome music, great gameplay, and graphics that get the job done! I give it a 9/10. I have already started on Lufia & the Fortress of Doom – the sequel to this game story-wise but prequel in terms of release dates. Stay tuned for that review later this year!